Can Dentures Affect Periodontal Health? When tooth loss occurs, the health of the entire mouth is in jeopardy. Adjacent teeth will be left without support and may eventually cave in. Oral functions will become compromised, and the strength of the bite will weaken. Restorative dentistry treatments can replace missing teeth so that the health of the gums and any remaining teeth do not suffer. When multiple teeth have been lost, dentures may be the most appropriate way to address tooth loss. Traditionally, dentures are removable restorations that sit over the gums. 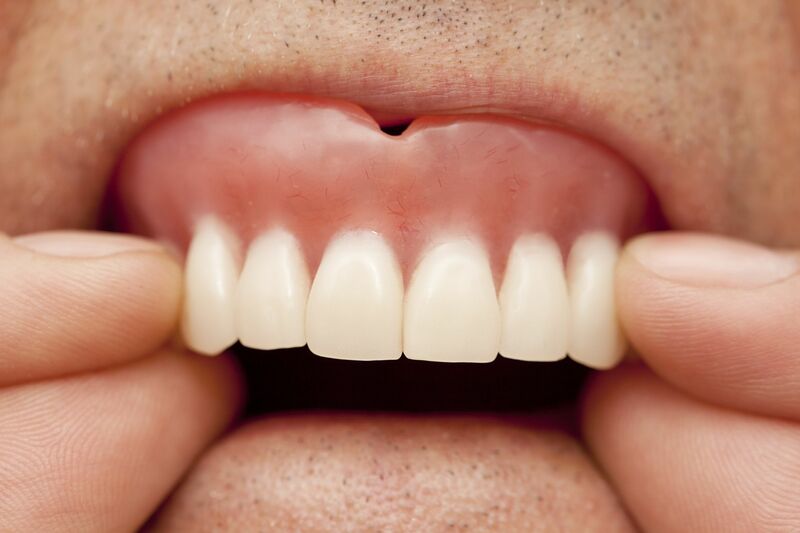 Although dentures are meant to preserve oral health and strength, there have been some concerns that dentures may actually compromise periodontal health. Dr. James Altomare is happy to discuss dentures and periodontal health with his Skillman, NJ, patients, as well as offer oral care tips that will promote a strong, healthy smile and gum line. The condition that has the biggest impact on periodontal health is periodontal disease, or gum disease. Gum disease develops when bacteria reaches the gum tissue and causes inflammation and infection. Regular brushing and flossing, along with routine dental cleanings, are often enough to prevent most people from developing periodontal disease. However, some patients are more susceptible to this condition. One factor that has been highlighted by some as a potential risk factor for gum disease is the use of removable dentures. This is somewhat misleading. The use of a removable denture alone will not increase the risk of periodontal disease. However, if dentures are not cleaned properly, they can hold on to dangerous plaque and bacteria, both of which increase the risk of gum disease. Similarly, if a patient fails to practice proper oral hygiene habits while using dentures, they are more likely to develop periodontal disease. If a patient is having a hard time caring for their dentures or maintaining good oral health while using traditional dentures, they may want to consider implant-supported dentures. Implant-supported dentures are anchored with surgically placed titanium posts and can be brushed and flossed just like the natural teeth, making oral care much simpler. If you have suffered from tooth loss, there are many restorative dentistry treatments available to improve oral strength and preserve the health of your smile. Schedule an appointment at your earliest convenience to learn more about the wide range of tooth loss treatments offered by Dr. James Altomare.